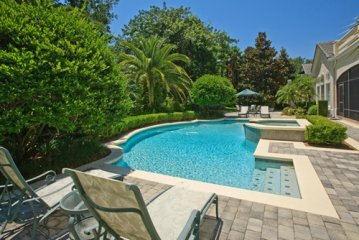 This beautiful home sits on a ¾ Acre lot overlooking the verdant greens of the famed Isleworth golf course. Stately twin Palm trees accent the formal entrance which is approached from a grand circular drive. The estate is framed by a lush, tropical landscape that is viewed through ceiling to floor windows and glass walls which span the entire rear of the home. 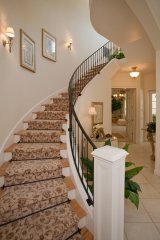 The gracious residence is a perfect blend of formality and casual elegance throughout its 7539 sq. ft. of living space. There are 4 bedroom suites in the main house and a detached guest apartment which offers a very large bedroom/sitting room, kitchenette and full bath – perfect for staff, in-laws or guests. 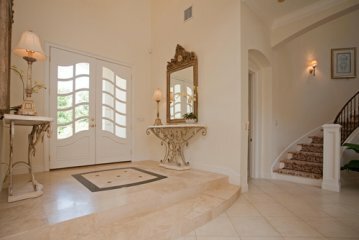 Double French doors lead to a spacious interior including a two-story foyer where one is greeted by a graceful winding staircase. The formal living and dining rooms are defined by stately columns. A crisp white Kitchen features an abundance of cabinets topped with gleaming black granite. 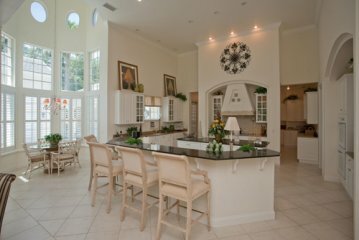 The Kitchen opens to a grand Family Room - a perfect gathering place for family. The master bedroom, beautifully appointed with lounge chairs and tables, adjoins a spacious bath with twin vanities tub with jets and large shower. 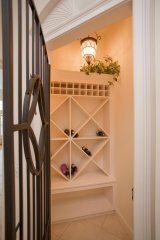 The second floor has secondary bedrooms and a wonderful media room with lounge chairs, sofa and a convenient wet bar for refreshments. The second floor also offers golf front balconies framed by Roman balustrade which overlook the tranquil setting of the golf course. There are many windows, some of which are ceiling height, and French doors which open to a charming screened Porch with paver flooring. The swimming pool and spa are nestled in a beautiful tropical setting which offers maximum privacy. An iron gated entrance leads from the circular drive into the porte-cochere which connects the main house to the garages. A spacious Guest Apartment is located above the garages to afford visitors maximum privacy. 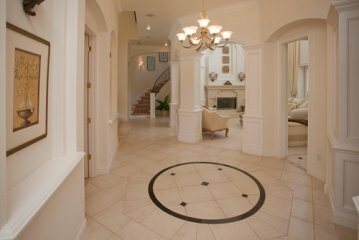 This stunning home is located in one of Orlando’s most prestigious gated country club communities. Club membership is available. Club activities include tennis, swimming, a fitness center, casual and formal dining and a beautiful championship golf course. The community is located on the famed Butler Chain of Lakes, and there is a private launch area where one can enter a series of eight lakes connected by navigable canals. Shopping at the famous Millenia Mall, Disney attractions, fabulous restaurants and medical facilities are all only 15 minutes from this property. Golf front! Fully furnished!